Ninety devotions showing that dogs are God’s four-legged reminders of all His best attributes: joy, compassion, loyalty — and most specifically — unconditional love. Every dog is different, but each loves his or her human in a special way. Often they are brave, noble, and strong. Sometimes they make us laugh, at them and at ourselves. Always they make us feel less alone and more loved. 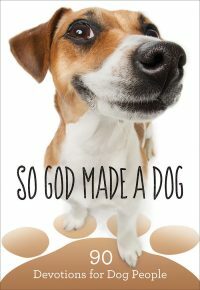 These ninety devotions will encourage and inspire you as you see how God is revealed in the antics and actions of our four-legged friends.